The Genesis Arm Chair is built with the same contemporary styling and high-quality components as our Pew Chair model, but with arms for added comfort. These chairs also come with built-in ganging so you have the option to connect them for an experience similar to theater seating. Our Genesis model is available as a standard Pew Chair, or with arms as the Genesis Arm Chair. This extra feature provides a supportive armrest for your congregation. Additionally, as part of our Best Value series, this chair is built with the budget-conscious church in mind. The Genesis model features a roomy seat, strong foundations, and modern styling. Choose the fabric color and frame finish that best match the look of your sanctuary. Learn more about the product details below. Enjoy all the quality and value of a ChurchPlaza chair with the additional comfort of chair arms! Quality industrial grade plywood foundations are CARB 2 certified, safe from cancer causing formaldehyde emissions, and compliant with US Composite Wood Products Act. Foam is free from formaldehyde, in compliance with California Proposition 65, and certified to have non-detectable levels of emission levels from TDCPP. Chair fabric is in compliance with JIS 112 , The Oeko-Tex100 and American Textile Restricted Substances List regarding formaldehyde emissions. Fabric treated with MoistureBarrier™ to protect against stains. Frame is finished with chip resistant electrostatic powder coating. 3½ inch of dual layer virgin foam in the seat. Rolled front suction in the cushion for extra comfort. Continuous pew-like seating surface when ganged together. View details of our comprehensive product warranty. Looking for information on measurements and dimensions? 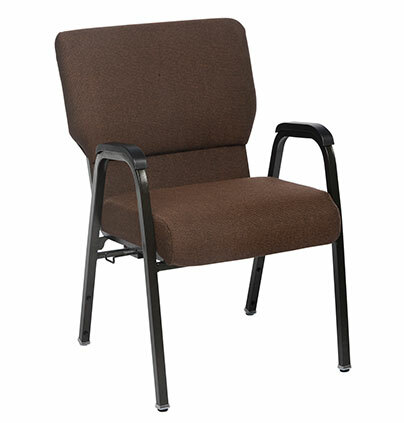 View the product spec sheet for our Genesis church chair.